The talented artists at Fat Cat Flowers, among the best and most sought after wedding florists in the New Orleans area, crafted the amazing floral arrangements for this large and extravagant wedding reception at the Omni Royal Orleans Hotel in New Orleans, including this beautiful bouquet for the bride. 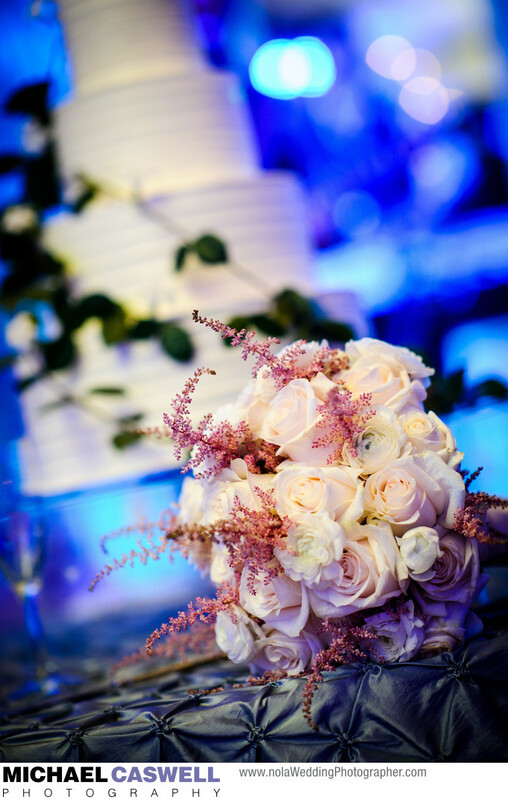 Photographed here on the cake table with the cake out of focus in the background, the blue uplighting along the walls behind the cake provides a visually pleasing contrast with the warmer tones of the bouquet. I usually capture wedding reception details like this while the guests and everyone else are eating dinner, as there is otherwise not much to shoot during this time.